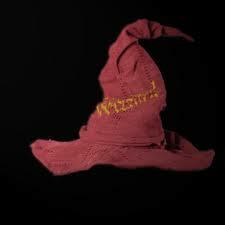 The Pointy WIZZARD Hat is a bold artifact found only in the personal affects of the most well-heeled monsters. Though once in the foggy ancient history of Godville this hat was considered the pinnacle of high fashion, it is now an item of clothing considered the mistake of a generation and so is never worn. It is unknown how monsters use the Pointy WIZZARD Hat, though the cryptozoologists of Godville speculate that it is the trophy that appears somewhere in every monster family's attic because some ancestor dutifully collected it from a deceased hero, and now is considered such an embarrassment to own that monster family members are choosing to sacrifice themselves in fights with heroes in order to get rid of the accursed things. Heroes use the Pointy WIZZARD Hat to augment their wallets. The origins of the Pointy WIZZARD Hat are largely unknown, the first and only reference explaining their existence appearing in one room of the paleodeic caves at Vector Field. This room has a wall that bears a single inscription of considerable length describing the headwear of fashionable Godville residents at the time, and is festooned with wrought paintings of people wearing cone-shaped hats with the letters "WIZZARD" emblazoned across them in brilliantine purple. Inexplicably, the wall also has six painted handprints in the positive and negative styles, and a sketch of an early hero throwing a blunt weapon at a proto-heffalump. The Pointy WIZZARD Hat made its reappearance in Godville society approximately eighteen years ago, when an unfortunate hero (name concealed to protect the innocent) who knew no better picked it up from the carcass of a slain multi-legged luggage. At first, he took it for a new type of equipment, and proudly wore it on his head. While he did so, no monsters appeared in his path, and a Godville Administrator even fled across some particularly hazardous radioactive terrain to avoid the hero. He walked as if under pacific aura until he completed his quest, setting the first pre-epic quest record for distance from Godville, not broken until twelve years later by a heroine with a freak eight-hour aura of pacifism and a helpful Trojan horse. Disaster did not strike until the poor hero returned to Godville. A detailed check of gatekeeper logs at the gate to Godville reveals a mocking notation about a hero in a hat disgraceful even for a level 1 hero entering the city and being charged 832 gold coins in customs fees. Other heroic chronicles from the day in question record sightings of this hero in bars, getting pushed around by the bouncers, and other heroes. The general consensus of these chronicles is that the hero wearing the hat must truly be the most stupid of all, because wizard is spelled "WHIZARD," not "WIZZARD." Trade ledgers from that day also show that merchants considered the hat to indicate the same intellectual level as the heroes thought, and said merchants proceeded to swindle the hero out of everything in his inventory. The ridicule became so wide-spread that it came to the attention of the Godville Ministry of Disruption Prevention (GDP), which decided to monitor the problem. Soon, the GDP discovered that more and more heroes were beginning to retrieve these hats, and, either too embarrassed or otherwise unable to sell them, and certainly too horrified to wear them, were letting the headwear pile up in inventory. This resulted in heroes bringing in fewer items to sell, which in turn impacted the market of raw materials for Godville's famed exports, and so reduced Godville Domestic Product (GDP). Faced with the disruption of the GDP, the GDP declared the Pointy WIZZARD Hat a Godville Defense Priority (GDP). To fight this GDP threatening the GDP, the GDP established collection points that paid bounties for sets of Pointy WIZZARD Hats so as to supply research materials for defense laboratories. Such measures immediately created a market for this GDP, leading merchants to consider the item worth paying a reasonable price to acquire, and so they began requesting Pointy WIZZARD Hats from heroes, clearing out heroes' inventories, allowing the heroes to carry their capacity in trophies, removing the crimp in raw materials supply, restarting the export market, and generally solving the whole problem. Except for taxes. Import taxes shot up to pay for the GDP's bounty on the GDP that threatened the GDP. ↑ Extract from the "Fashion Wall" of the paleodeic cavern at Vector Field: First made popular by amateur wizard, er, WIZZARD Rincewind, a new fashion trend was started. You can see many smug heroes walking around boasting new pointy caps with WIZZARD spelled out in bright purple. Not only that, but now many people of all trades have started labeling their OWN occupations on their headwear. This is considered QUITE fashionable, and in some more wealthy neighborhoods you rarely see a single person without a steel BLAKKSMITH or bell-covered JESTERR hat. This page was last edited on 8 February 2019, at 23:53.